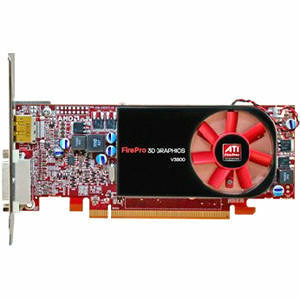 Introducing the ATI FirePro V3800 professional graphics from AMD. This entry-level workstation solution with 512 MB of DDR3 frame buffer memory is ideally suited for entrylevel CAD users who work with small to medium sized models and fewer assembly parts and components. Its 30-bit display pipeline1 offers accurate color reproduction and advanced visual quality. Based on a new generation GPU with 400 stream processors, the ATI FirePro V3800 ultra parallel processing architecture optimizes throughput by automatically directing graphics horsepower where it's needed. Intelligent management of computational resources allows enhanced utilization of the GPU to enable real-time rendering of complex models and scenes while enabling increased frame rates when animating.